So it's a new adaption from Judge Dredd, 1995, and this time I love the outfit. Why? Just look at the costumes wore by Stallone and Urban. STALLONE IS TOO GAY! Why must there a belt to emphasize on the ding dong? Anyway, I did not watch the original Dredd movie. 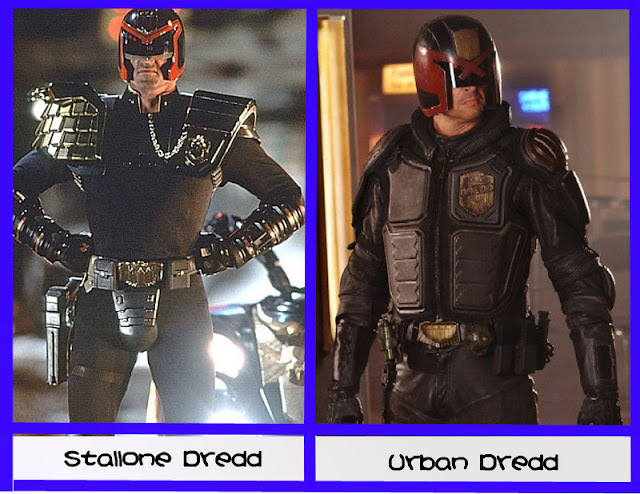 The funny thing is, I still do not know who is acting as Dredd until I Googled. 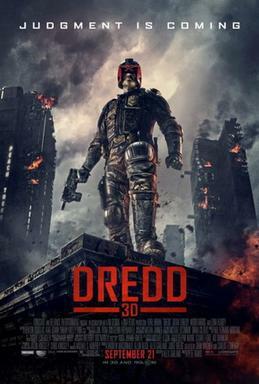 Apparently is Karl Urban as Judge Dredd and I couldn't recognize him at all. I love his gun, the super hi-tech gun with the ability to "Staple" your wound. Olivia Thirlby as Anderson, the rookie who has psychic power to read people's minds. She sort of read everyone's mind, except for Judge Dredd. The only issue about her was, she's too skinny! Lena Heady as Ma-Ma, the one who controls Peach Trees. I personally have no idea how all the guys are willing to be her minions. She's a lady, without any psychic or super natural power. Except for the scars on her face, I don't see why the guys are afraid of her. Plus, her scars did remind me of Joker, WHY SO SERIOUS? Why does everyone think that this is a remake? It's a new adaptation! I thought it was gritty enough.